Whether you have modern side-by-side refrigerators or traditional bottom mount models, leave their services to us. When fridges fail to operate well, there will be trouble with food preservation. When it comes to fridge problems, there are often leaks. Such problems are handled by our company fast. 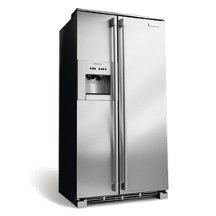 Get in touch with Appliance Repair Vaughan as soon as you notice any fridge complications and malfunctions. Not only will our pro arrive quickly to your house but will also complete the refrigerator repair Vaughan service in one visit. Which are the most common problems with refrigerators? No matter what the fridge problem is, contact our Vaughan refrigerator repair specialists. We arrive at your house as soon as possible and carry an assortment of tools. From diagnostic equipment to replacement parts, our techs always have what they need in their trucks. Our techs start the service by troubleshooting and diagnosing the problem. We can replace the water filters, door seal, evaporator coils, compressor, thermostat and any other damaged fridge component. The fridge is leveled and adjustments are made to ensure good performance. We are experts in freezer & fridge repairs and so can fix both parts of the appliance. The refrigerator repair techs from our company in Vaughan have the knowledge, knowhow, and skills to service the kitchen appliance effectively. We are thorough and won’t leave before the fridge is accurately fixed. Our expertise extends to all models, types, and brands, and so we are ready to service any refrigerator. Our company guarantees rapid refrigerator repair service, but it will be a convenience to you to let us maintain the appliance occasionally. This way you won’t deal with emergency problems. When fridges are regularly checked and maintained, they don’t waste energy and operate at their peak efficiency. We are here to cover your routine refrigerator service needs upon your request. Call us for any service related to your fridge & freezer. When these appliances break down, there is serious trouble. Contact us to replace the door seal and clean the coils to ensure the appliance performs at its best. We are masters in what we do and available to provide same day refrigerator repair in Vaughan, Ontario.